Nina Dumrukcic was born in Sarajevo in 1992, but her family lived abroad in several different countries due to the fact that her father was a diplomat. She attended primary and secondary school in London, completed the IB Diploma Programme in Druga Gimnazija Sarajevo and Bachelor’s degree in English Language and Literature at the University of Sarajevo, although she also studied abroad at the University of Warsaw in Poland. During her studies, she worked for the organisation AIESEC as a local and national executive board member, where she had the opportunity to attend and facilitate at conferences in Bosnia and Herzegovina (BiH), Poland, Belgium, Switzerland, Austria, Estonia, Greece and Russia. Miss. Dumrukcic was also the event manager for an annual international congress in Egypt with more than 700 participants from 120+ countries. This was followed by an internship at Yale University in the USA where she held workshops and seminars for undergraduate students. After obtaining her M.A. degree with honors at Heidelberg University, she received offers for a PhD at the universities of Cambridge, Edinburgh and Lancaster, but decided to stay in Heidelberg as a research assistant and is currently teaching at the English Department and investigating “Translanguaging and the Bilingual Brain” at the Heidelberg University Language and Cognition Laboratory. 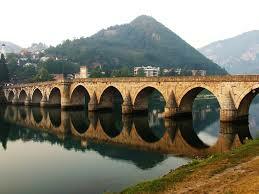 You lived in Germany, and arrived in 1997 for the first time in Bosnia and Herzegovina? Can you describe your first impressions? I grew up hearing all about BiH and my parents made sure I was fluent in our mother tongue and knew all about the culture and tradition. Meeting my grandparents for the first time was an extraordinary experience but I got used to living in Sarajevo fairly quickly since it sort of felt like coming home, even though I had never been there before. My early memories include spending most of my time playing outdoors with kids from the neighborhood and starting school. Honestly, the only thing I really missed from Germany were certain brands of sweets that were not available in BiH. On the question of assimilation in BiH and the time spent living abroad, Miss Dumrukcic says that she had been living in BiH for about 3 years before her family moved again, this time to England. Returning the second time around was indubitably more difficult because she was a teenager and had a little trouble getting used to switching languages and changing environments once again. During the interview, Miss Dumrukcic has especially emphasized that she did sometimes feel torn between two cultures, but BiH was still home for her. Continuing on the topic of assimilation, Nina says that most of the teachers were quite understanding and helped her to overcome the language barrier, while she made some amazing friends, got used to the Bosnian food, music and general way of life, and stayed in Sarajevo for a further 7 years. Currently, you are doing your PhD at the Heidelberg University, and at the same time you are a teaching assistant! Can you tell us how such a young woman can manage everything? It is very time consuming and good time management is essential in order to balance work, research, travel, exercise, social activities and leisure time. I am used to it, because I worked throughout the majority of my studies, first in NGOs as an undergraduate student, and later to finance my Master’s, sometimes working two or even three jobs at the same time, including teaching children, administration, translating, waitressing and I spent a few summer holidays working at the Sarajevo Film Festival. At the moment, I plan my schedule at the beginning of the month to include teaching, marking students, work on research projects at the department, lab time and work on my dissertation, and maybe preparing a paper for a conference or attending a seminar by a guest lecturer. In order for it not to become too overwhelming, I like to spend quality time with friends and family, or I kick back with a good book or movie. What are your plans for the next five years? Are you planning to come back to BiH? Well, hopefully I will be done with my PhD by then! I definitely want to stay in academia, so I would like to go abroad as a visiting scholar to one of our partner universities, and with a bit of luck, I will attend even more conferences and have more publications. I am very passionate about my work and love to immerse myself in researching topics that I am interested in. I am very much in contact with my colleagues at the Faculty of Philosophy in Sarajevo and I frequently come to conferences, therefore I hope this cooperation shall continue. If the opportunity presents itself, I would be happy to spend part of my academic career in Sarajevo since I find it is important to transfer the knowledge and experience I obtained at some of the leading and prestigious institutions to younger generations in BiH. It is always such a pleasure to return to my alma mater and discuss recent trends in academia with my former mentors and peers.